Visit the Centre to see our amazing fossil collections and find out how to discover your own fossils on the beach. Admission to the Centre is FREE however as a small charity, your kind donations help keep the Centre open. We welcome over 100,000 visitors a year and the Centre is your first stop to discovering the Jurassic Coast and it’s fossils. 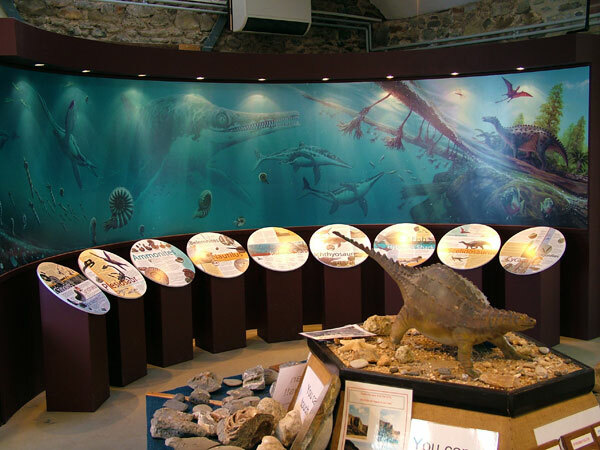 The Centre provides information on fossils, fossil hunting and the local coastal and marine wildlife. Facilities at the centre include hands on displays, marine tanks and a video microscope, all of which can help you to discover more about our stretch of the coastline. You will always find a helpful warden or volunteer who can help you identify your fossil finds. The Centre also has disabled access. Our Jurassic Theatre shows a short film on ‘The Jurassic Coast and Finding fossils at Charmouth’ (adults £1, children 50p). We also have a shop stocked with books for all levels, including some of our own publications, toys and souvenirs. Throughout the year we run guided fossil hunting walks and rockpooling walks along the local coastline. The Centre also has an extensive education programme. For information about the activities we have to offer to school groups please see our Primary Schools and Secondary Schools sections. The Centre was set up in 1985 to encourage safe and sustainable collecting of Jurassic fossils from the local beaches. Since that time we have slowly expanded and now have three wardens plus a large group of hard-working volunteers. Being a charitable trust we are reliant on the support of a large and active friends organisation who help to man the desk, build displays and undertake management roles. Our latest phase of improvement was supported by the Fine Foundation and the Heritage Lottery Fund.